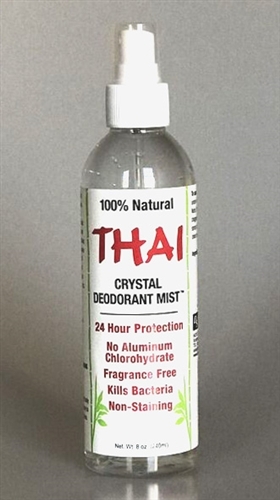 Thai Crystal Deodorant Mist from Deodorant Stones of America (DSA) is a liquid deodorant spray made from natural mineral salts. These are the same salts that are found in DSA's deodorant stones. 100% pure and natural, it's a deodorant that is good for you and the environment. It eliminates body and foot odor and offers 24 hour protection. Unscented and non-staining. Non-aerosol. Aluminum free. Hypoallergenic. No alcohol. Ozone friendly. No parabens or propyls.